Located near Embankment and Charing Cross is the Benjamin Franklin House. 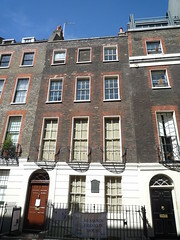 Where, oddly enough, Benjamin Franklin lived during his (second) time in London. He left hurriedly at the outbreak of the revolution. 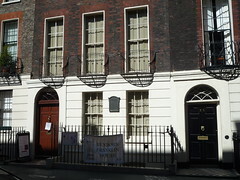 Franklin and the House acted as the de facto embassy for the colonies in London. During his time in London he lobbied British politicians on behalf of the Americans (with mixed success), continued exploring science and his discourse with the minds of the Enlightenment. All while being a lodger in the house and developing friendships with that family. The facts of Benjamin Franklin’s life before, during and after his time in the House are explored although understandably it is his time in London that features most prominently in the experience. The novelty of the House is that it is less a museum and more a theatrical performance. After a brief video setting the scene the audience is greeted by the landlady’s daughter who proceeds to take us through the various rooms of the house, often accompanied by multimedia elements (audio/video) and tells us of ‘her’ and her family’s experience with Franklin. I was apprehensive about coming to the House, thinking the conceit of the actors would be tacky and unbearable. I was wrong. It was well done, the actress who must do this dozens of times a day gave a great performance and I feel like I’ve developed a greater appreciation for Franklin and the period as a result. The House is operated by a dedicated group of volunteers and in addition to their website (where you can also download a walking tour podcast) they can also be found on twitter. It costs about £7 (adult) and runs for approximately and hour.